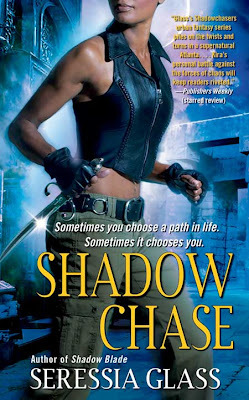 A couple of weeks ago Seressia Glass posted a link to a small grey-scale version of the cover to Shadow Chase, her second Shadowchasers novel. Now Juno Books has released the final full colour version. The book is due for release in August and Shadow Blade (Book 1) just hit shelves last week. As a Shadowchaser, Kira Solomon has been trained to serve the Light, dispatch the Fallen, and prevent the spread of chaos. It’s a deadly job, and Kira knows the horror of spilling innocent blood. But now she has a new role, as the Hand of Ma’at, the Egyptian Goddess of Truth and Order, and an assignment that might just redeem her. A fellow Shadowchaser has gone missing, and so has a unique artifact imbued with astonishing magic. Unless the Vessel of Nun is returned, it will cause destruction beyond anything the modern world has seen. 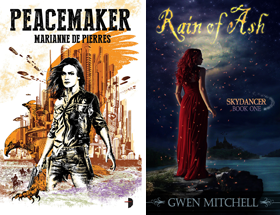 Kira’s got a team at her back, including Khefar, a near-immortal Nubian warrior who’s already died for her once. But as complicated as her feelings for him are, they’re nothing compared to the difficulties of the task she faces. And the only way to defeat the enemy at hand is to trust in a power she can barely control, and put her life—and her soul—on the line. Okay Doug you gave me another couple of books for my To Buy list and loving this cover more than the one for book 1, this lucky author has good art people. Thanks for sharing the "pretty". Jackie I am pretty sure the book is from Juno and they always have excellent artwork. This is my 1st moment i see here. I located so lots of interesting stuff in your website, especially it is conversation. From the tons of feedback on your posts, I guess I am not the simply one having all the enjoyment here! Keep up the good job.